What can I, Twiga Rafiki originally of Tanzania, say? After some sunny days and what we thought would be spring weather, today we all woke up to this wintry scene. While I like Chicago a LOT, I have to admit that this made me wish a bit for my homeland. It is plenty warm inside, fortunately. Oh my- as we say, "Hang in there Twiga Rafiki- the sun will come out tomorrow" and winter will eventually fade away. You will enjoy our Summers! Aaaaw , bless !! poor Twiga Rafika must yearn for the warm sunshine of his homeland when the weather returns to a miserable wintery scene ! Home - the sweet place to be inside. He's wondering what you've brought him to! Hopefully May flowers will compensate for this storm. Do very much like the simplicity, like the frost juxtaposed with Twiga Rafiki. Where have you brought me to? I am a prisoner looking out on a cold world! Help! At least it’s warm in here! Great image - he looks home sick for the warmth and sunshine of his country! Oh dear, turn up the heating. I can hear him talking!! You have caught him perfectly! He's obviously feeling the cold too! 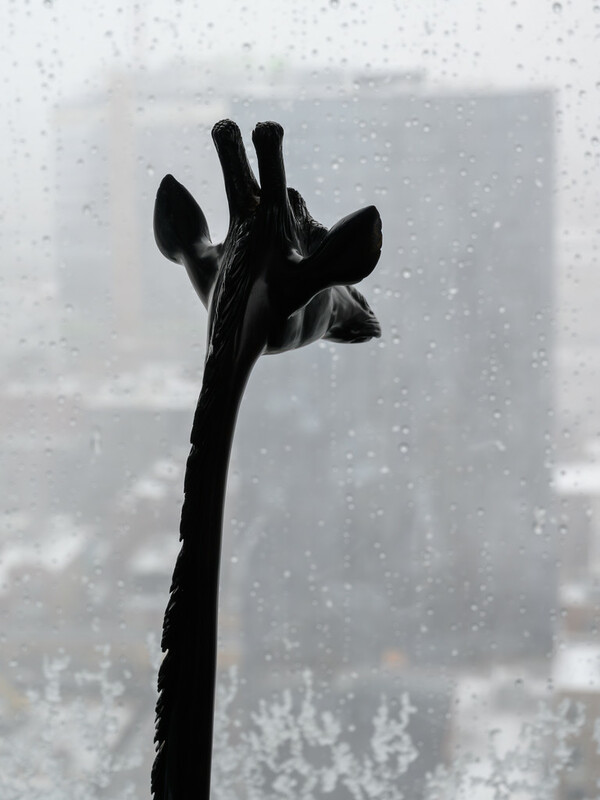 Poor Twiga doesn't look too impressed with the rain, maybe get him an umbrella. @jnadonza A wooden one we brought back from the safari trip in January. About 4 feet high. Such creative narrative to accompany your great shot! Bummer. This too will pass. Clever shot and creative commentary. I can just imagine the sad look on his face. LOVE the image, LOVE your narrative.